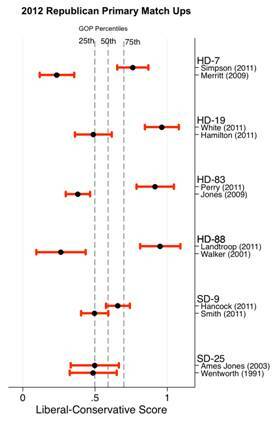 The Senate District 25 race is proving to be the most competitive race in the Texas Senate. The incumbent Jeff Wentworth is fighting for his life. Elizabeth Ames Jones, Wentworth’s other challenger, claim that she balanced a $10 billion shortfall without raising taxes was found to be mostly false by Politifact. But before I go any further, as I have said before politics is a blood sport and things are going to be said in a flurry of half truths and lies. And as usual, a hotly contested race will kick up dust. Wentworth has two opponents, Dr Donna Campbell and Elizabeth Ames Jones, challenging him for a position he has held in the Texas Senate since 1993. He has gotten complacent and his shine has tarnished after 19 years of politics as usual. 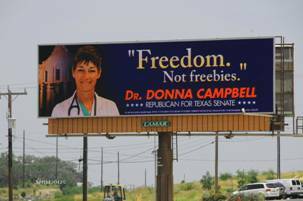 It’s time for him to exit and have a true conservative replace him, and Dr Donna Campbell is that conservative. Mark P. Jones, the Political Director at Rice University, has just come out with some very revealing statistics on the Senate District 25 race. According to Mr. Jones, Wentworth and Ames Jones ideologies show no differences. The results of his data show a similarity linking Wentworth and Ames Jones in ideology, making it virtually impossible to distinguish between the two. Of course, this is what Tea Party members and Dr. Donna Campbell’s supporters in SD25 have been saying all along. 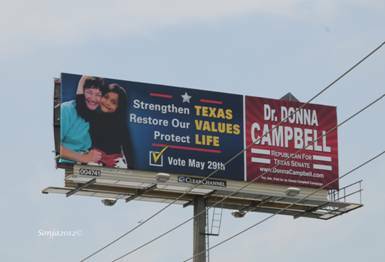 Dr. Campbell is a fiscal conservative endorsed by Texas Right to Life and Texas Alliance for Life among others, while Jones and Wentworth have scores in the 25th percentiles from the same group, leaving little question that these two leaned left of other House Republicans during their time in the Texas House. We should all be a bit curious as to why Wentworth is hanging onto a ‘job’ he has longed to leave. But when there is no place to go, ‘hanging on’ is about all he can do. He openly flaunts his Pro Choice stance without apologies. Listen to what he had to say in front of 300 voters at the Comal County Candidates Forum stating that he is indeed Pro Choice. This is taken from Wingright written by Beverly Nuckols.